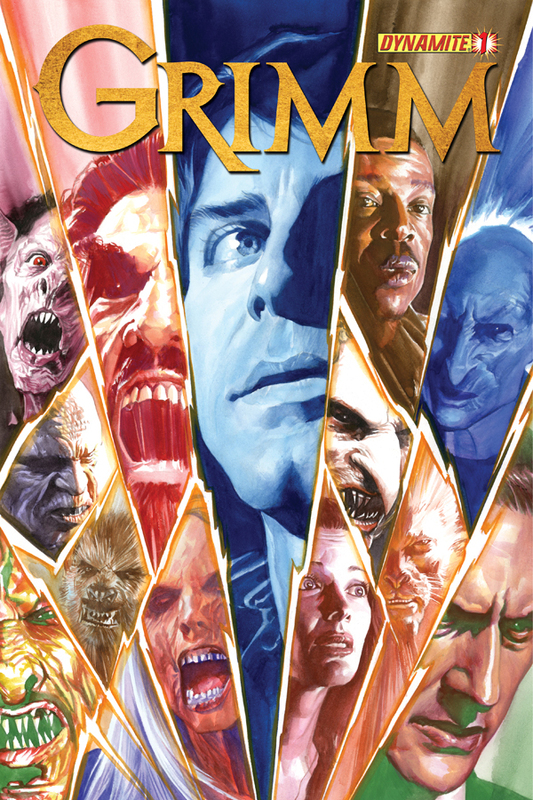 The Fellowship was fortunate enough to obtain a copy of GRIMM #1 from Dynamite Entertainment. The plot is by Jim Kouf and David Greenwalt, the script is by Marc Gaffen and Kyle McVey, with art by Jose Malaga, colors by Thiago Dal Bello, and lettering by Marshall Dillon. Nick Burkhardt has traveled to Venice, Rome to find and rescue his mom Kelly and help her to destroy the three coins of Zakynthos. Nick is accompanied by his partner Nick and Monroe in his quest. In Venice they locate Laszlo Dietrich, a man who supplied Nick’s mom food and weapons whenever she was in town. The search leads them to a church and a deadly trap. How will our heroes get out of this mess? Who has kidnapped Kelly and what does he want? GRIMM is based off the NBC television series by the same name. The issue does a pretty good job filling in newbies (such as myself) enough information so you can get the gist of what’s going on. This was an interesting start for a story arc (and series). Jose Malaga’s art is very nice and great job by Thiago Dal Bello on colors. I’ll give it a few more issues to see if it grows on me. I’m sure fans of the show will enjoy the book. GRIMM #1 is stores now or available for ordering at www.Dynamite.com.